I Can't believe it is May already. We have had such a warm spring that all of the flowers are early by almost a month. A few weeks ago there were artist's receptions for the Legacy Salon and the Richeson 75. I wasn't able to attend either one. 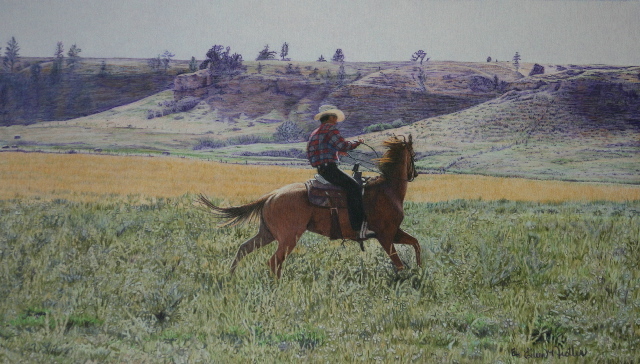 I have had artwork accepted into the Colored Pencil Society of America and the Wyoming Governor's capital arts exhibition. I have been busy working on art for the upcoming western shows. Here is my latest painting. It is called Companeros. This is my back yard and this man, named Enrique, was hired to break some or our horses. You wouldn't know it but this horse was a knot head for everyone but Enrique. He had the magic touch. The second time that he climbed on this horse he had someone hand him his baby girl to give her a ride.